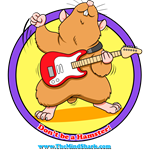 Welcome to Joe Curcillo | The MindShark's Don't be a Hamster! Shop. 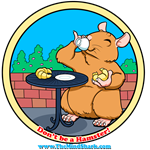 These cute little guys are the stars of my book "Don't be a Hamster! : 30 Ways to Spark the Imagination of Busy People" (available on Amazon). Tired of running in the hamster wheel of life? Does it seem like no matter how hard you work you're still in the same place you were last month, last year, five years ago? The solution is simple: Don't be a hamster! Stop spinning your wheel! Wear these guys to tell the world you "escaped the wheel!" and are ready to say hello to a brighter tomorrow. This is where the Cafe Hamster Lives! This is where Zen Hamster Lives! This is where Rock Hamster Lives! This is where Super Hamster Lives!